If you doubt that the materials from our green bins really get recycled, consider this: the landfill charges the City of Montreal about $70-80 per tonne to take in residual materials. But the sorting centre doesn’t charge the City anything—it makes its money from reselling the materials to recyclers. The other thing that might convince you is a tour of the centre itself. Located in the St-Michel Environmental Complex, the Centre de récupération et de tri des matières recyclables de Montréal is housed in an old building of the former Miron quarry. 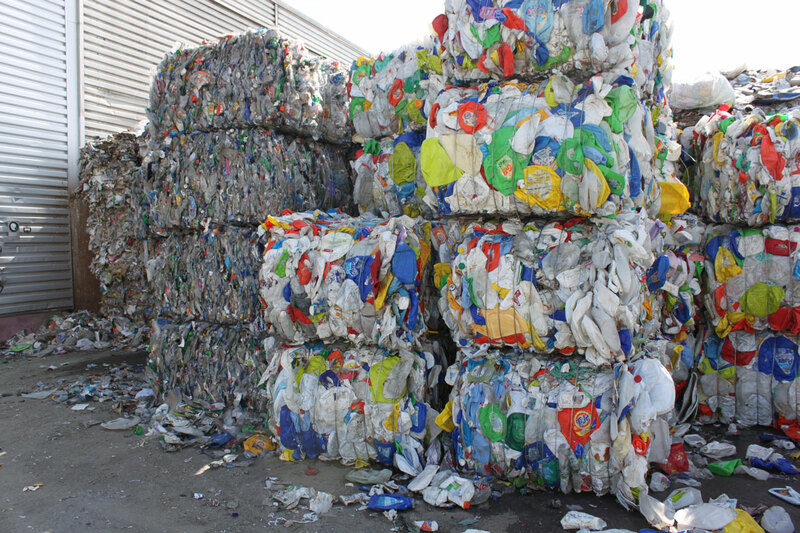 Although the premises are owned by the City of Montreal, the centre is operated by the Groupe TIRU, which has a ten-year contract (2009-2018) to take in all of the island’s recyclables. That amounted to 148,000 tonnes in 2010; the number is expected to climb to 200,000 in the next few years. It is by far the largest sorting centre in Quebec, and one of the bigger ones in North America. After the initial manual sorting, the materials start going through the automated systems. First is a system of rotating disks, which carries flat items like paper and cardboard upward and onto a different conveyor: the goal is to send all the fibres to one side of the centre, where they are sorted into cardboard, newspaper, and other (mixed) paper. Glass gets crushed and falls down; plastic and metal continue through. Next, a magnet picks up the metal objects (except for aluminium, which is sorted at the end. Note: aluminium is also the most valuable material for recyclers). Finally, plastics get sorted by an optical reader: using tiny beams of light, the machine detects the different types of plastic, sending plastics 1 and 2 (most valuable plastics) one way and plastics 3,4,5 and 7 into the mixed plastics (plastic 6 is not recyclable). “When you have a choice between taking your empty peanut butter container, rinsing it out and putting it in your bin so that it can be recycled into another plastic object, versus putting it in the garbage, burying it in a landfill, and then extracting more oil to make new plastic, the choice is clear,” says Leduc. The automated systems do not catch everything, so at every stage, workers are stationed along the conveyors to manually sort items the machines have missed. As they’re sorted, the materials drop down into alcoves. On the lower floor, materials are pushed out from the alcoves and into a compactor, bundled like bales of hay, and then loaded onto trucks. The City still pays some of the recycling costs. 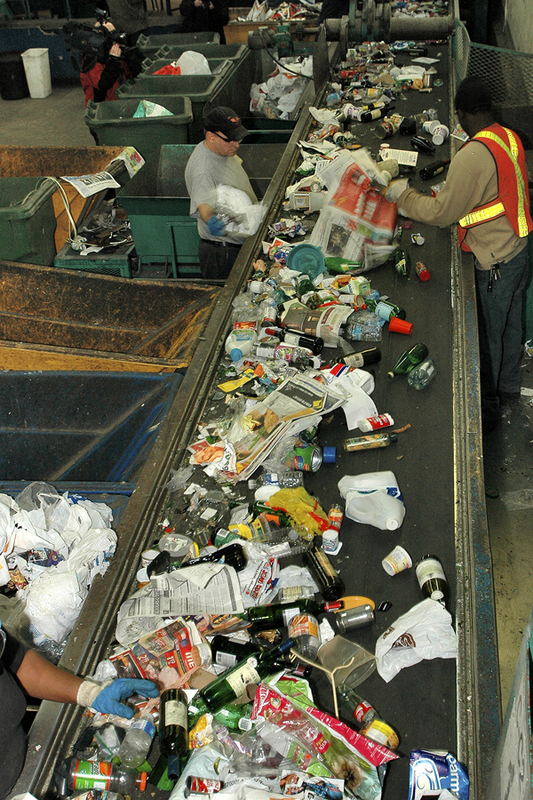 For example, it shares the disposal costs for items that cannot be recycled—about 6-7% of the materials collecte. The current contract also stipulates that beyond a certain threshold, the sorting centre and the City share losses or profits. “In 2010, we arrived about even,” Leduc says. The bundled materials are sold to recyclers, who transform them into substances that manufacturers can use to make new objects. Because the sorting centre’s revenues come exclusively from selling the materials, they generally go to the highest bidder. Yes, that means that a lot of materials get shipped overseas. Leduc adds that efforts are being made to keep more materials at home: for example, he sits on a committee with representatives from Recyc-Québec and various industry associations that aims to bring Quebec recyclers and sorting centres closer together. “Progress has been made within the last six to twelve months,” he says. Related articles: What is the City honestly doing with its recyclables? While shredded documents are recyclable, they can get caught in equipment or fly off the conveyor. Shredding also reduces the paper’s recyclability, because it cuts up the fibres. Leduc’s advice is to shred only what’s absolutely necessary. Computers, LCD or plasma screens, and other ICT devices should be brought to an ecocentre, where they will be reused, recycled, or disposed of in a safe way. If you’re not sure whether or not something can be recycled, get informed: call your Eco-quartier, consult the City’s website and Household Recycling Tips (PDF), or call the City’s info-line, 311.